Nuclear weapons no longer feel like an immediate danger; there are no more school drills under desks, or newsreels of the bright lights of nuclear tests. Instead, they’re monolithic safety nets that we’re led to believe can protect us. That’s a sweet sentiment. But, that’s exactly what it is: a sweet, naive sentiment that lets us forget that these iron giants were forged in human suffering and deception, and will continue to leave a path of destruction in their wake, unless we take action. Yesterday, January 27th, is now recognized as the National Day of Remembrance for Downwinders. A national day of remembrance, in this instance, is mere lip service to devastated victims and grieving family members. Those are the sentiments of one anonymous downwinder, born from hearing the manic ticking of a geiger counter passed over his body and finding massive amounts of radiation. 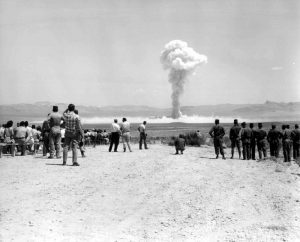 Downwinders is the shorthand used to describe those exposed to radioactive fallout from nuclear testing, but the name fails to encompass the truly life changing effects of living in the chalky, pink dust of nuclear weapons testing. These people have been largely forgotten, but the truth is that the first victims of nuclear war are still living among us, that it is if they aren’t one of the victims who have been picked off in droves by cancer. It’s a devastating inheritance that can’t be swept under the rug. While the U.S. government has made some effort to repair the devastation, the impact has been marginal. The Radiation Exposure Compensation Act (RECA) provides a small sum to those impacted by the health effects of the testing in Utah, Arizona, and Nevada, but neglects the victims in New Mexico and Idaho. Unfortunately, unknowing citizens living near the Tularosa site in New Mexico are ten times closer than victims surrounding the Nevada testing sites. 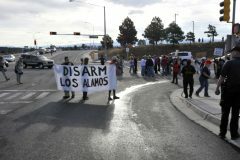 Established in 2011, the National Day of Remembrance encompasses all victims – including those in New Mexico and Idaho. And yet, attempts to expand RECA to cover these victims that same year did not pass. The US nuclear system, built on the idea that “might makes right” has failed to protect even its own citizens, and will continue to wreak pain and suffering, leaving a trail of radioactive waste behind it. Beyond the Bomb is committed to putting checks and balances on our nuclear system; but more than that, we’re committed to the intersectionality of nuclear weapons and the marginalized communities they’ve harmed. For us, that means standing in solidarity with these communities at events like this month’s Indigenous People’s March, and working towards reparative justice for both people and land. We’re proud to partner with groups like the Indigenous Peoples Movement, and to follow their lead as we work together to right these wrongs. These issues are ongoing, and we need you in this fight with us. 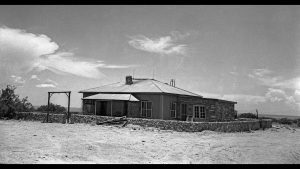 The first nuclear weapon (known as the trinity test) was detonated a few miles from here in 1945. The device was assembled here at the McDonald ranch house. If this bill can pass the House, we expect a sweeping revision to not only include the entirety of Clark and Mojave Counties, but also increase the compensation to $100k (as proposed in the previous “Jumbo Bill”). We remain hopeful that those affected will never be forgotten, and further validation is ahead for ALL Downwinders and their families. NEVER FORGET!